This year we will divide second graders classroom students in two groups. 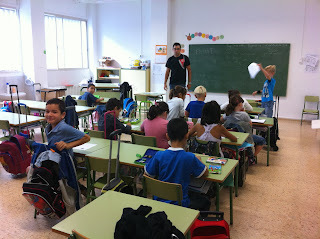 There are about 25 student in A and B. Sergio and Virginia will be teaching at the same time to the same group. It will be easier to help students and work with ecoarts. Yellow or Green group will use the classroom or the 'Taller' to work. It'll be fun to change classrooms too. Both of the spaces have a sink.